Parents!!! This online registration is new for all of us and I have had many of you register which is great but we have had a few problems. If you have a Student who is NOT a Kindergarten student and were at our school last year then your child is not a NEW student. If you have never called to get your Student’s ID # to set up a Passport/Aspire account then you would choose to register as a current student without an Aspire account and it will ask you for their Student ID which if you don’t know, you will need to call and get it from us. If your student brought home any kind of end of year progress report, most likely their Student ID is on that but we can give that to you if you call. Leave a message if we don’t answer and we will get back to you. IT YOU HAVE AN INCOMING KINDERGARTEN STUDENT AND HAVE TALKED TO ME AT THE SCHOOL THEN THEY ARE NOT CONSIDERED “NEW” AND YOU WILL NEED TO CALL AND GET THEIR ID FROM THE SCHOOL AND THEN REGISTER THEM AS A CURRENT STUDENT WITHOUT AN ASPIRE ACCOUNT. 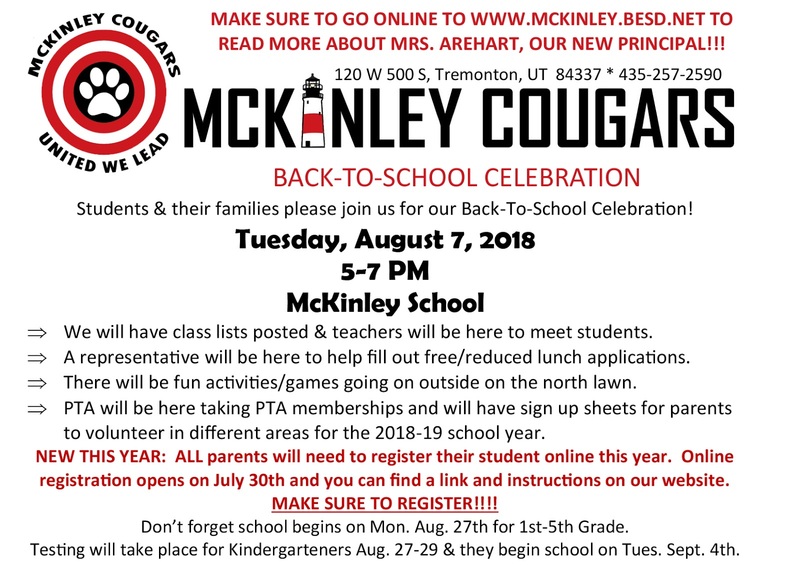 ***IF YOU ALREADY FILLED OUT PAPERWORK AT THE GETTING TO KNOW YOU OR ANOTHER TIME FOR THE KINDERGARTENER THEN YOU WON'T HAVE TO DO THE ONLINE REGISTRATION THIS YEAR. If you registered your student online as a NEW student and they attended McKinley last year or are a Kindergartner who I already put in the system then you will have to re-register them with their Student ID creating an Aspire account with that ID. Please call is with any questions and thank you for being patient as we embark on this new online registration journey together! Click HERE to go to the online registration instructions and link. Please read through the instructions to help you with the registration process. Hi everyone, I'm the new McKinley Elementary principal, my name is Corynn Arehart. I'm so excited to be on this epic journey with you this year!! Mr. Chournos and I have worked many, many hours this Spring and Summer to help us have a smooth transition and to make sure I have the information I'll need to support all of you! To let you know a little bit about me, I have shared a quick video, as well as a little write up. Who is Corynn; I'm a military wife, I have been married for 24 years, and my husband is currently serving active duty in the Air force. He has been serving for 25 years now, we might be nearing retirement this year.... I was born and raised in Wisconsin, and then moved around between Chicago, Wisconsin, Maryland, and Georgia. We lived in Italy for 3 years and then transferred to Utah. I have lived in Utah with our children since October 2000. We have planted seeds and let the roots grow for our kids while my husband has toured all over the US and overseas. It was important for us to have our children have a place to call home. I currently live in Lewiston UT on a little hobby farm, we have dogs, chickens, goats, ducks, horses, cats, and lots of fun!! I have 3 children, 2 son-in-laws, and 1 grandchild, she just joined us 4 months ago, and we love her to pieces! My baby just turned 16 and is getting his license later this month. YIKES!! We are a rodeo, 4H, horse loving family, and when it's just to hot to ride horses, we play on our family boat. In the winter I love to snowmobile, snowshoe, and play outside. I'm trying to learn to quilt and sew, along with embroidery. I have taught at BEHS for 9 years in Special Education, I taught math, team taught Elem. Algebra 1, language Arts, Study Skills, Social skills through Adaptive P.E., and World Civ. I then obtained my 1st maters degree in Curriculum and Instruction and then obtained my 2nd masters degree in Administration School Leadership. I have been a principal in BESD for 4 years. I love working with students, parents, teachers, staff member and the community and can't wait to begin building new relationships with our Tremonton families!! I'm passionate about the Leader In Me and believe in the positive outcomes it creates for students to become their own leaders!! Every child deserves to learn the tools to help them in school, society and for life!! 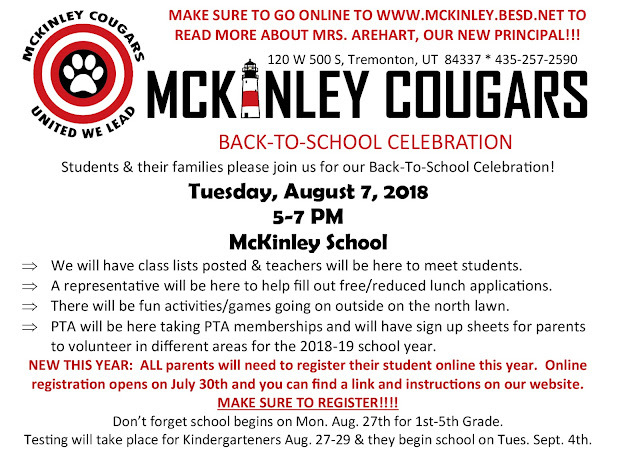 Our vision this year at McKinley is to teach and show students how to use the 7 habits, how they are all leaders, and to do it in a collaborative process through unity. Our theme this year is UNITED WE LEAD!! I have an open door policy- please contact me anytime via email corynn.arehart@besd.net, my phone or texting 435-740-1315, or by calling the school directly. I'd love to hear from you, please send me a shout out. As families how have you sharpened your saw and built family relationships this summer?